If someone can give me a hint it woud be super. I want to translate the game in Bulgarian language, so this MSG files are verry important. I'd be more than happy to help, but I'm going to need a few things from you. ...lucky for you, I just finished a RDT extractor and repacker for Bio3, so it will surely help you on your quest. I,m using image from a russian version for the example, so this are russian not bulgarian character. They are similar but not identical. I see the upper two rows with the smallest fonts witch are not numbered on the picture i will change them. more characters than english and russian and if i continue i have to remove valuable characters for mercenaries menu on blue 3. Absolutely! You can design it however you deem necessary. Just make sure the characters match, in-order, with the UTF-8 that you provide. Its strange that the original TIM file have 60 sets, but when converted to bmp, edited with photoshop and repacked as TIM again... it only contain 30 sets. The files you've provided will work just fine. 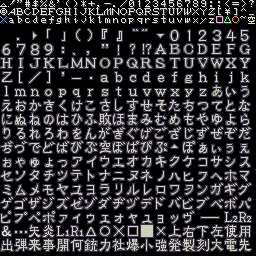 Just to note, the "smallest fonts" (Yellow) aren't used in-game - they are used by debug builds. I will have a tool that will help assist message creation for ya soon. As for your examples, it looks like there's an alpha channel/transparency issue. You may want to look into a better TIM plugin/creator. Last edited by MarkGrass; 04-29-2014 at 09:47 AM. I most certainly haven't forgotten. Work and warm weather kind of occupy my time, now, but I will have a tool for you as soon as I can possibly get it to you. It will convert Unicode text file (*.txt) to MSG data, and allow you to view the TXT file, as well. I had to change the parser from UTF-8 to pure Unicode, so I hope it's not a problem. Just remember, Unicode! You can make MSG files from unicode .txt's . May be the game description isn't located only in this 3 files.... I noticed that they are just 1 kb each... it don't make sense. Really looking forward to diving into your Biofat program, mainly so I can copy visuals from the sourcnext releases to the English releases (the closest I've come so far is copying the zmovies lol). The only issue I'm coming across at the moment is the blasted .dat files in RE3. I was sure originally I had a more recent version of Biofat that could handle this. I had trouble working it at first and I was going to return to it at a later date but after a recent issue with Windows Update I've lost it. However reading this thread better shows be I had an old version of the program (an unstable version?) so I had to jump on and ask (kindly ) could you help me regarding the .dat files? What program/method should I use if there is one with the .dat files? I've downloaded the latest version, and I don't know how to use (There is no Readme on the .rar) and asks me for a .INI, I want to open Biohazard 1 Betas files. PmData created some very useful utilities for Bio3 PC that support files with DAT extension. You should be able to easily find it (and others) at the modding forums (just google "resident evil 123"). biofat is completely untested in Linux/Wine and I have no means of testing it. I'm sorry to say that if you use Linux, you're on your own. biofat is closed source, due to a few bad apples in the past. I'm totally sorry for this, but it keeps my sanity in-tact. biofat is primarily an English application, with room for expansion supporting other languages. Currently, I do not have any plans to add proper support for other languages, however. Although biofat used to support many non-BH/RE video games, that is no longer the case and never again will be. Surprisingly, yes, the project is still alive. I don't have nearly as much time that I used to, but I still add to it from time to time (with plans to eventually release the newest build).